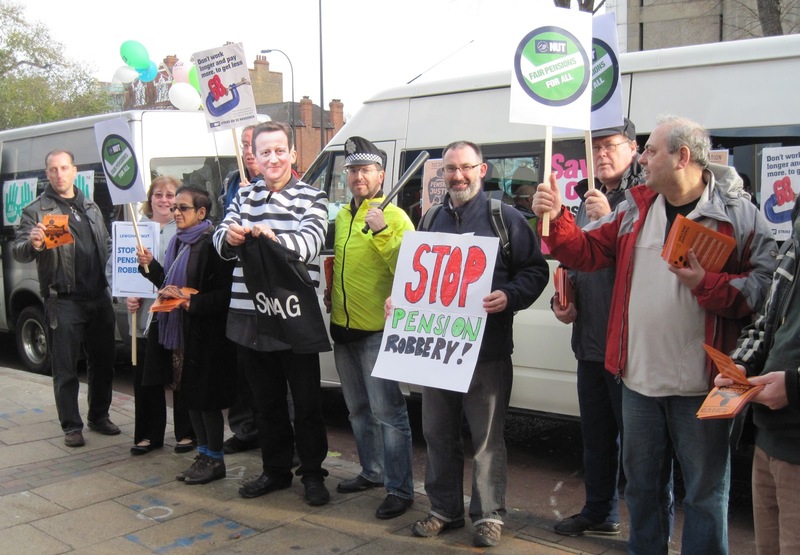 Today, Saturday November 26th, trade unionists took to the streets of South London in their pensions 'battle bus' to take their message to the public - "Fair Pensions for All!" Representatives from just some of the twenty-plus different trade unions taking strike action on Wednesday November 30 helped give out leaflets across the boroughs of Lambeth, Lewisham and Southwark. ATL, NUT, PCS, UNISON, UCU members - and others - started the tour in Brixton, before going on to Streatham, Catford, Lewisham, Deptford, Peckham and Camberwell. 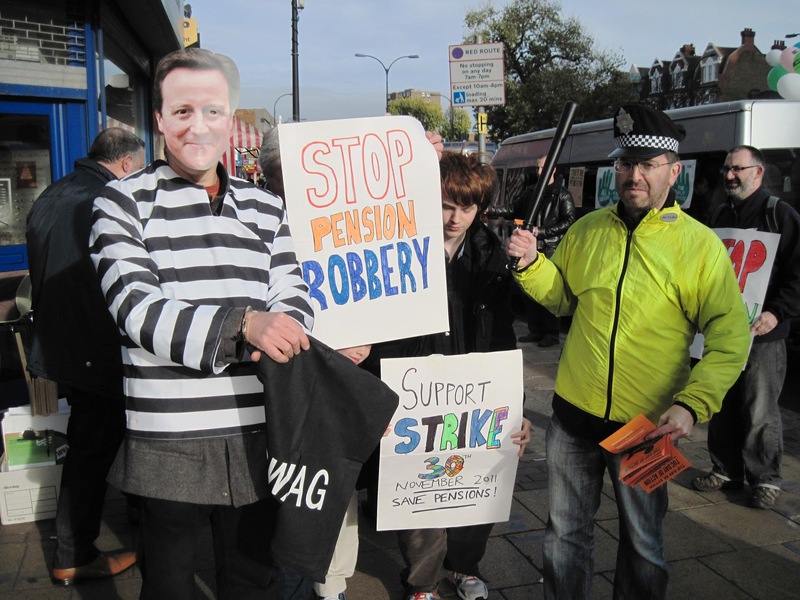 The photos show that we were joined by Mr Cameron with his 'swag bag' who appealed to the public for donations to his 'save the millionaires' fund. Many passers-by made very clear to the Prime Minister exactly what they thought of him! 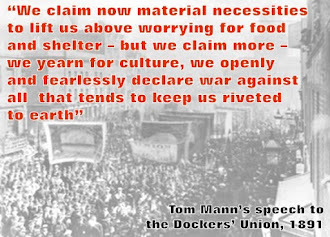 That determined message will be firmly passed on to the Government when trade union members form schools, council offices, job centres, colleges and many other South London workplaces join the millions who will be on strike across Britain to defend public sector pensions on Wednesday. "We got a great response from the public. Most South Londoners understand that this Government of millionaires is trying to steal away everything that we have won in the past - whether it be pensions, jobs or public services. That's why we are determined to send a clear message to Ministers when we take strike action on November 30 to 'Stop the Pensions Robbery!' "
Most teachers won’t be able to do a good job at the age of 68. But we will be forced to work on while our school leavers struggle to find a job vacancy! Cuts to our jobs, pay and pensions will do nothing to help improve the economy. 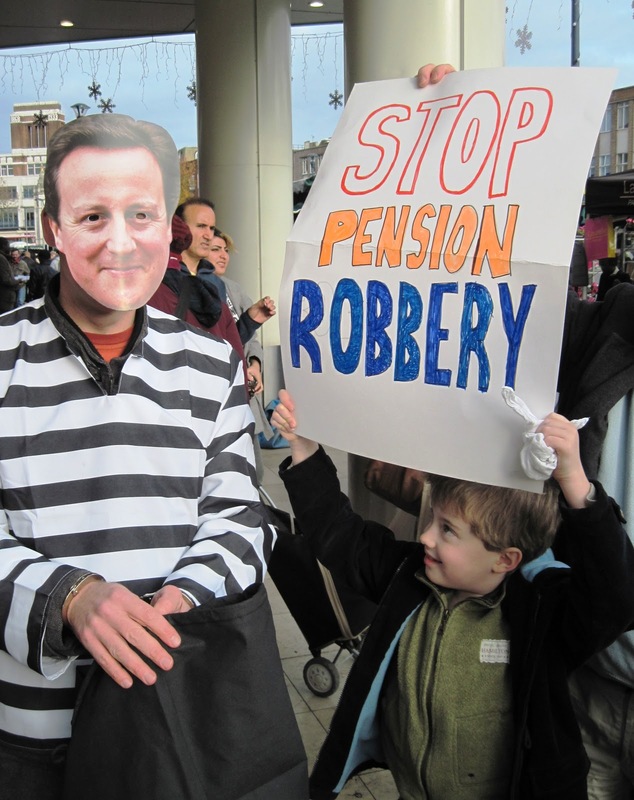 Cutting our pensions won’t help save anybody else’s job or restore private pensions. If the Government succeed, it will only encourage them to carry on cutting everything else as well. But, if we can persuade them to think again, other campaigns are more likely to win too! * There will be picket lines at a number of workplaces on Wednesday morning. Trade unionists will then be gathering outside the Town Hall in Catford from 10am before taking the train to Charing Cross to join others assembling at 11.15 am. 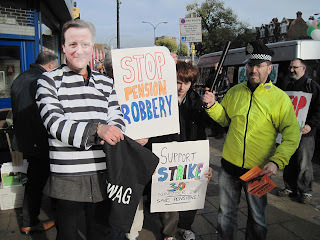 The Lewisham delegations will then join the main London march assembling in Lincolns Inn Fields from midday.